From mid July, the ‘My Marketing’ tool will no longer be available in the ProAdvisor portal. 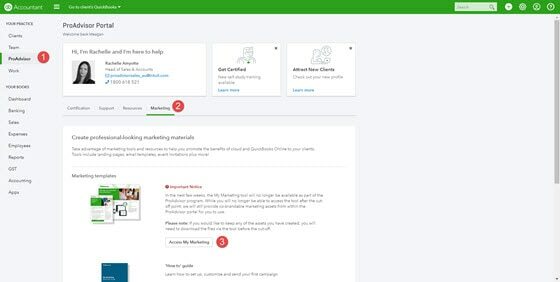 Removing the ‘My Marketing’ tool means you’ll no longer be able to use the templates to create co-branded marketing assets like emails, banners and web landing pages. However, we’ll still provide marketing assets in the ProAdvisor portal to help you promote your practice. Keep an eye out for them in the near future. If you’ve used the ‘My Marketing’ tool to create any assets and would like to keep what you’ve created, we recommend you download the files before the tool is removed. To download your assets, access the ‘My Marketing’ area in the ProAdvisor portal and click on ‘My Activity’. This will display a listing of all the assets you have created. 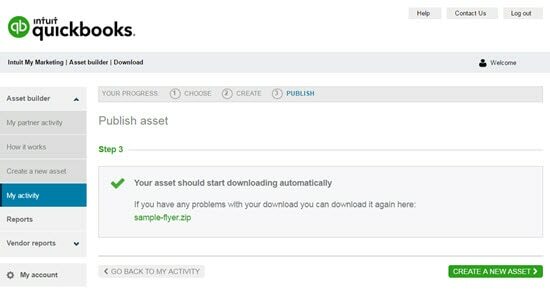 Depending on the asset(s) you’d like to download, you may need to re-publish it to get the option to download it. Simply click on ‘Re-publish’ on the asset(s) available to download and follow the prompts. If you have any queries or need some help, please chat with your account manager or call the ProAdvisor care team on 1800 114 837.